Want your website to load instantly 24/7 at an affordable price? Managed cloud servers are the best solution for this, without having to hire a tech. Many years have passed without anything major happening in the web hosting industry. The most serious issue for websites in the last 8-10 years remains security and speed. The hosting industry leaders are not working hard enough to develop a solution. Instead, they continue competing on pricing, disk space and other standard features. When you start your blog, shared hosting works okay. In fact it would be a waste to pay for expensive hosting. When your site start making income, at a certain point it would make sense to upgrade to better hosting where your site doesn’t go down all the time. Scala Hosting and other hosting companies wanted to fix this and allow website owners to sleep well knowing their data is secure and their website loads instantly 24/7 with no risk that another website on the same server may affect their business. Shared hosting: the hosting provider sets up a powerful server and puts several accounts on it. The exact setup of the server is in your provider’s hands. Some hosts put just 8 accounts on a server, and sell it as “semi-dedicated”. Others put 4000 accounts on a server, and everything runs really slow. Somewhere in between is a good number that is responsible rather than over-crowded, but does not require them to charge steep rates. VPS: The hosting provider divides a server into a number of “virtual” servers. You are using a slice of a bigger server, but you get your own RAM and disk space. You need to install your own operating system, software firewall, MySQL server, web server, etc. VPS divides into “managed” and “unmanaged”. With managed, the host will set it up for you, and install anything else you ask them to, and trouble-shoot for you. With unmanaged, you install Centos, Debian, Ubuntu, etc. out of the box, and then it’s over to you. E. g. Digital Ocean is an unmanaged VPS provider. That means you have to administer, secure, update and maintain the server yourself. If you don’t have the expertise to do this, you would need to hire someone to do it for you. Or, go for either a managed VPS, or a non-overloaded shared host. 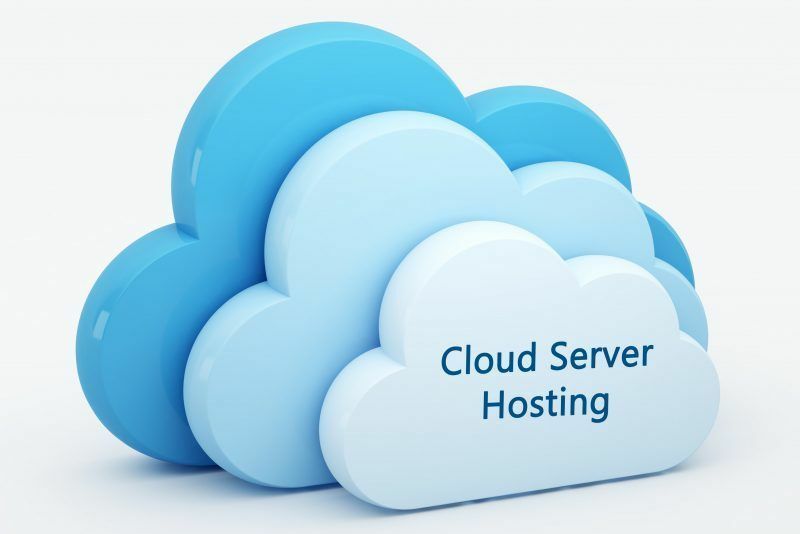 Cloud servers live in huge clusters which consist of multiple physical machines. The storage is central with multiple storage nodes and multiple data copies. Everything in the cloud is redundant and there is no single point of failure. Even if a whole physical machine fails, your cloud VPS will be instantly migrated to another healthy machine in the cluster. The data center loading speed depends on your location, so you have to choose the data center which is more close to you. It only costs $7 per month. Email is not included, however you can set up email service on your instance. They do offer managed support with control panel (cPanel/ Plesk) and can assist you to setup your instance and email services. It has the ability to setup WordPress easily and you can order a free or paid SSL certificate? In the last 2 years Scala Hosting has been working on the development of a new product which will allow every website owner to have their own fully managed SSD cloud server at an affordable price. Shared hosting can’t deliver the security and reliability which people need to grow and succeed. Shared hosting servers host hundreds of users and websites at the same time and when a single website is compromised, it is used to attack and compromise more websites on the same server because it is much more easier to hack a site when you have local access to the server. Having your own server resolves the security issues and brings lots of additional advantages. Hundreds of times better security. Guaranteed systems resources for high performance 24/7. Your own IP address which will guarantee that your emails will always reach the recipient and you will never be blacklisted again because someone else on the server sent SPAM. The shared hosting market share is decreasing and more people are moving their websites to their own servers to get high security, reliability and growth potential. In order for every website owner to be able to afford their own server the price is pretty significant factor. That’s why they developed 2 systems which make it possible to optimize the expenses and offer users their own SSD cloud server, fully managed by Scala Hosting with a control panel included and daily backups at an affordable price. Software to manage the cloud hosting cluster which saved us many thousands of dollars monthly. A control panel to manage each cloud server which saves the user the $15 cPanel license fee on monthly basis. That’s the reason why they initiated the process of developing sPanel. sPanel is the next generation control panel. It is a “all-in-one” solution for managing cloud VPS services. It includes everything a website owner needs in order to grow their business in a secure environment. As a CEO with 18 years of experience in the web hosting industry, Vince Robinson has seen a lot. He knows what website owners need and what will help them grow their online business quickly. After 3 years of developing sPanel, Scala Hosting has finally released it to the public in May 2018. The name of the control panel was naturally born and it comes from the name of Scala Hosting (Scala Panel or in short sPanel). The control panel at the moment has everything a website owner needs to manage their cloud VPS. sPanel is integrated with the Nginx web server which is running as an Apache proxy and significantly speeding up websites and TTFB (time to first byte) which is critical for ranking high in Google. The Nginx microcaching feature can speed up a website up to 1200%. sPanel supports the latest and fastest PHP 7.3 & MariaDB 10.3 to extract everything that can be extracted and achieve the fastest PHP processing. That is only possible with proper setup and the use of PHP-FPM plus Nginx microcaching. sPanel comes with memcached installed by default as another mechanism and caching layer to speed up websites. sPanel is a “all-in-one” solution for website owners who want to have the highest security and reliability for their websites. In simple words, if you are using sPanel you will not need to pay for additional licenses to have a fast, secure and reliable hosting service. Nowadays, to have a cloud VPS, website owners are forced to pay for several things to “build” a working solution. Add the hassle and effort to find the best company offering each of the items above and you end up wasting days. All those features are included in sPanel. sPanel Shield is the software that stops 99.998% of the attacks to websites. At the same time it is a real-time protection system which will notify you immediately should a hack happens. The shield will give you a detailed report of the attack and the affected data. It will help you secure your website and resolve the vulnerability which caused the hack. sPanel has an integrated and innovative backup system which can be configured to fit the requirements of every website owner. It stores as many restore points of your data as you want on remote backup servers. 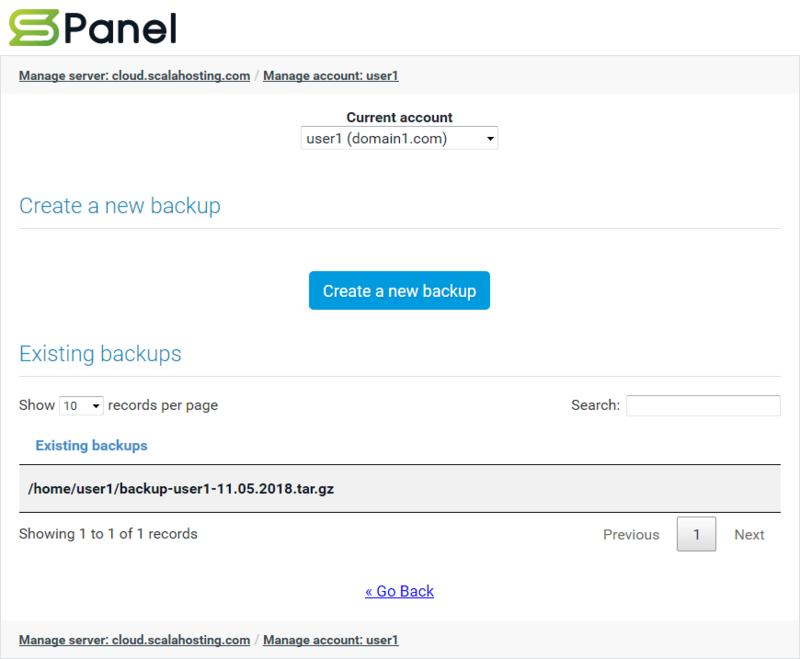 The sPanel backup system allows you to browse recovery points and restore individual files, whole directories and databases from the control panel through an easy to use and intuitive web interface. The WordPress manager in sPanel will make the life of WP users much easier. Except the standard install, uninstall, reset admin password, automatic updates, cloning and staging the WordPress Manager in sPanel comes with a feature that makes WP websites really hard to hack. Every WP website’s security is increased hundreds of times by implementing several security adjustments such as setting proper permissions of files with sensitive data, disabling PHP execution in the folders of WP which do not need it enabled and which hackers usually use to store their PHP malicious files and the most important one – sPanel WP Manager locks the installation so that none of the files can be modified or new malicious files uploaded. All websites hosted on sPanel servers get a free SSL certificate from Let’s encrypt automatically. The certificate is installed and renewed automatically. All communication on a sPanel server is encrypted for maximum security. All cloud VPS services with sPanel include free migration for unlimited websites. 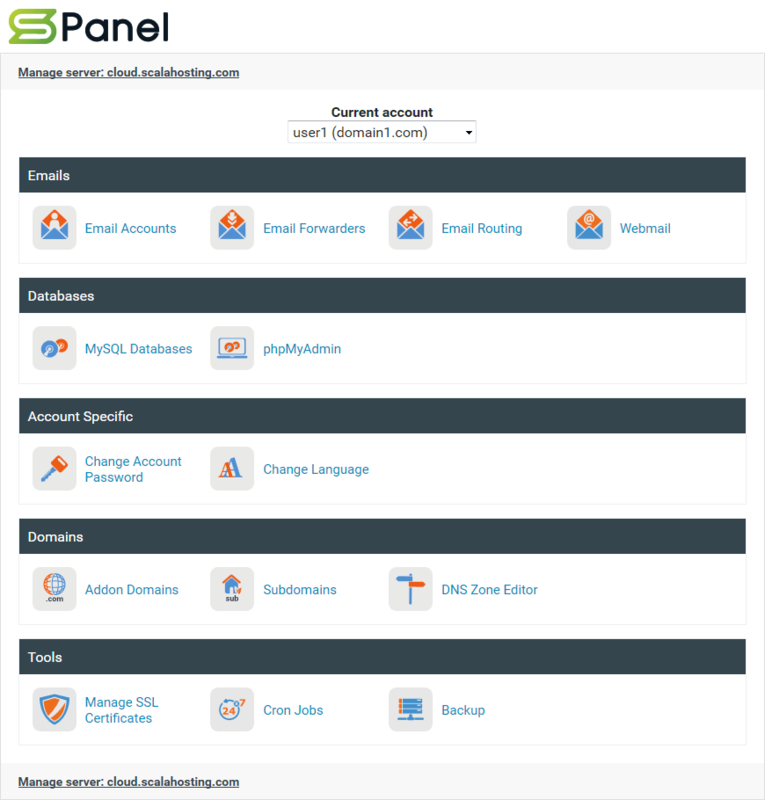 The control panel is 100% compatible with cPanel for quick and easy migration. Websites migrated from cPanel servers will function in the same way or faster on sPanel because of the Nginx integration and the fact that our systems administrators will tune the server to perform at its best depending on the requirements of the website. All your emails, passwords, databases and mysql users, addon and parked domains, cron jobs, email forwarders will be copied and working after a migration to sPanel. Our migration team works around the clock and ensures each website is working correctly after the migration. You are responsible for managing your websites and Scala Hosting is responsible for managing the server – just like shared hosting. The difference is you will have 100% of the server just for you instead of sharing it with hundreds of other websites which may affect your website’s performance at any given time. You can learn more about these new server plans at Scala Hosting’s website.